#1. 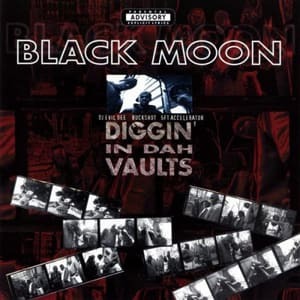 Black Moon - "I Got Cha Opin (Remix)"
This alternate and superior mix of "I Got Cha Opin" was the perfect convergence of everything that made the Boot Camp great: Da Beatminerz' triumphant but still shadowy horn samples, a skull-shattering call-and-response refrain, and Buckshot's unforgettable sing-song flow and eye for minute details. Check the dialect from his diaphragm, it condensed the bubble-goose-clad disposition of a BK street dweller into four and a half minutes better than just about any other record from the era.